Another Wednesday Storm. | "Northern Crossings"
I am officially sick of winter and snow and the fact that almost every Wednesday which is “church night” thanks to the death grip the school systems have on the rest of the lives of our children, we have had blizzards and bad weather and had to cancel all kinds of things. Winter has a tough effect on folks after a while and people start getting touchy and grouchy. There are supposedly, real verifiable physical and emotional effects to lots of snow and cold. Of course frost bite is pretty obvious but seasonal affective disorder is a little harder to diagnose among people who are prone to chew your face off even when it’s warm and sunny, but the disorders exist. 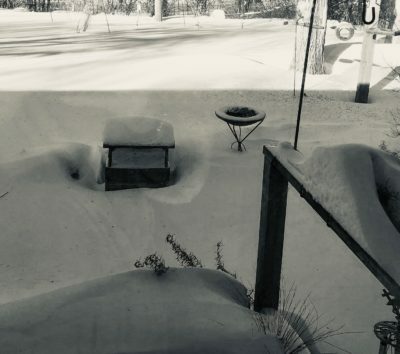 I always felt that winter up here in the North country got worse when there was no snow because the black dirt from the fields begins to blow all over and the country side looks filthy and black and the rugs in the entryway are covered in a black mud from the back snow. After a while you start to wish that a good round of snow would come and whiten things again. Then it does and your back to just wishing it would all go away. the Atonement over the dirt and the bloodspots – as I spread the white clothing of Christ’s righteousness over you all in baptism, as I clothe the sinner with the same righteousness, if he believes, and one hour on your deathbed shall spread the white burial clothe of the Atonement over your poor heart if you fall asleep believing in the merit of Jesus” . Think on these things when you get sick of the next snow fall. NextThe Green New Deal – Enthusiasms if You Can Find Them. A cup of cold water or pulling some weeds………..